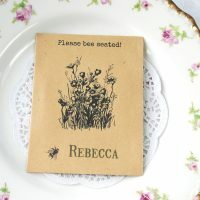 Categories: Unusual & Unique Wedding Favours, Personalised Seed Packet Wedding Favours, Full Colour Patterned Packets. 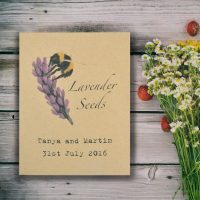 This handmade wildflower seed packet wedding favour is so gorgeous, handmade by us out of our vast stocks of fabulous printed papers! 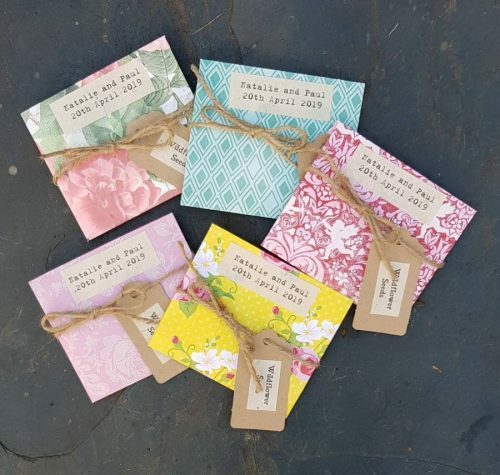 Each seed packet measures approx 10 x 9 cm and is cut from stock available at the time of ordering – therefore what you get will be a surprise mix! The photos are just to give you an idea of the sorts of designs available – you can choose between a light colours mix or a dark colours mix. The seeds are inside the packet in a sealed plastic wallet, as is a piece of tree-free natural-coloured Lokta paper with the sowing instructions. 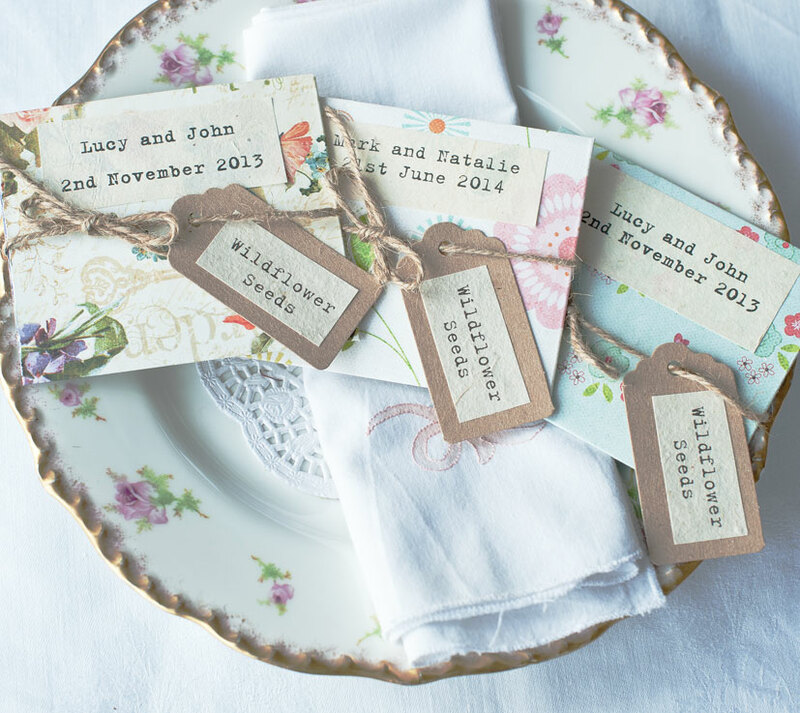 Your wedding details are printed on a piece of tree-free Lokta paper stuck to the front of the packet. 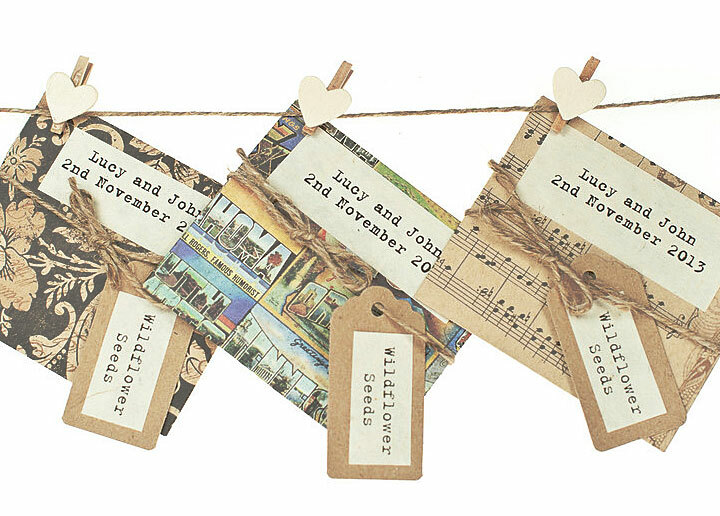 The whole design is finished off with a recycled manilla label attached with twine. The flap tucks into the back of the packet. Lokta paper is made in Nepal from the bark of the regenerating Daphne Bush. 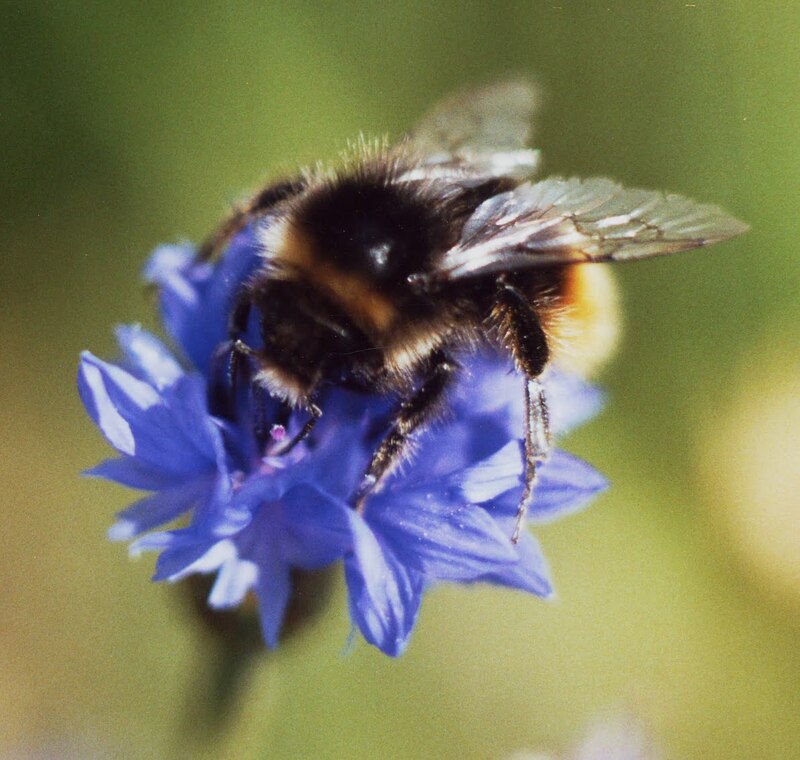 Our wildflower seeds are of British species only and are grown in the UK – Cornflower, Corn Chamomile, Poppy and Corn Marigold. Please advise your personalisation details above. 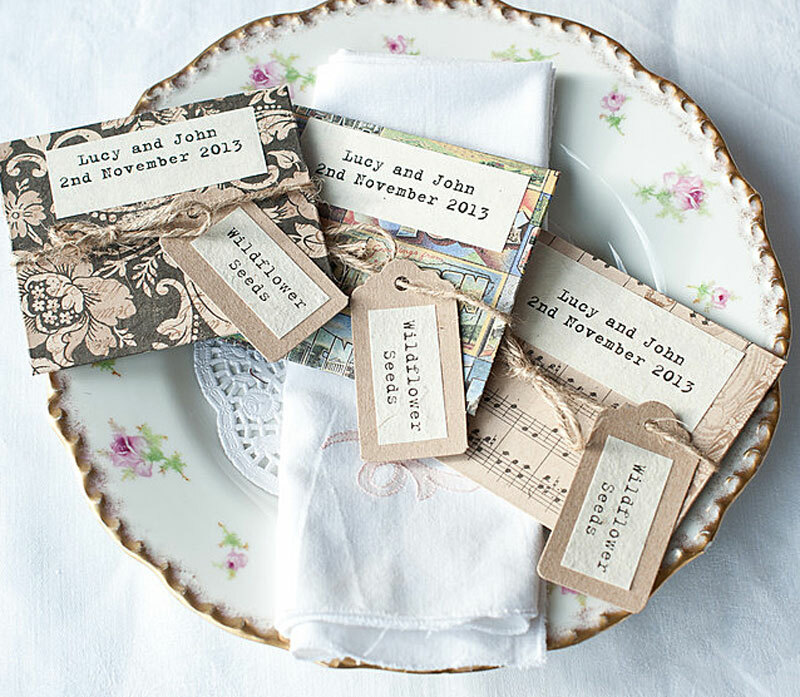 A fabulous and unusual favour, exclusively by us for you! 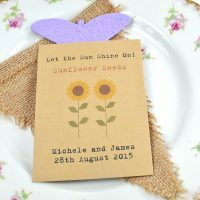 The seeds in our wildflower seed packet wedding favour are very easy to sow – best sown in Spring/early Summer. Simply choose a sunny, weed-free spot (or a pot of peat-free compost) and sprinkle on the seeds. No need to cover them with soil/compost – just gently press them into the soil. Water well and wait for them to germinate, watering if necessary. 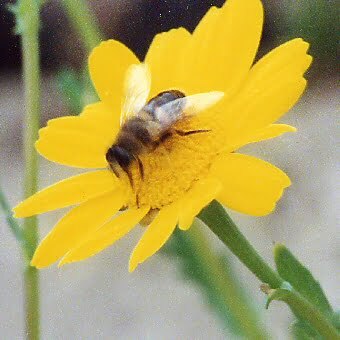 Corn Marigold (chrysanthemum segetum) is an annual wildflower with many yellow daisy-like flowers from June to October. It grows to a height of 20 in (51 cm). It is closely related to the Ox-eye Daisy and is also known as Yellow Ox-eye, Bigold, Boodle and Raddles. By the end of the fourteenth-century, tenant farmers were ordered to get rid of it from barley fields because it was such a pest. 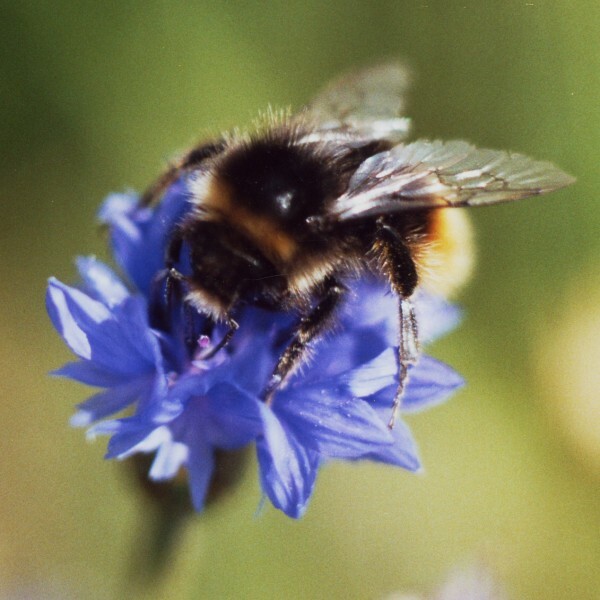 However, insects like its nectar and it is the food plant of the Chalk Hill Blue butterfly caterpillar. 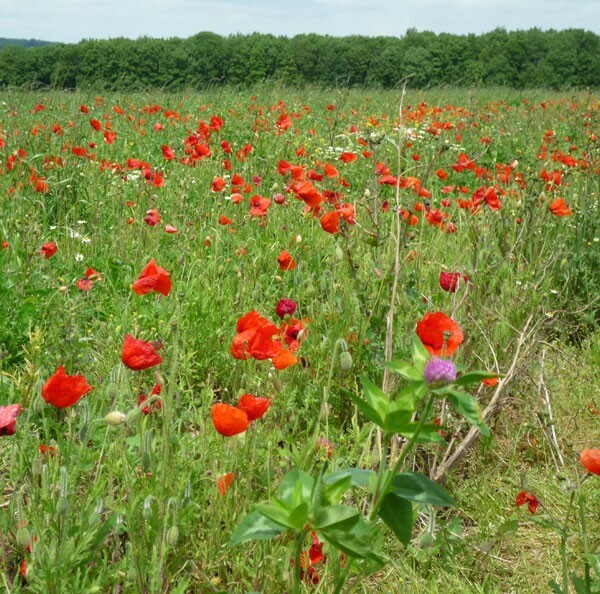 Poppies are annual wildflowers that attract butterflies, bees and hoverflies. 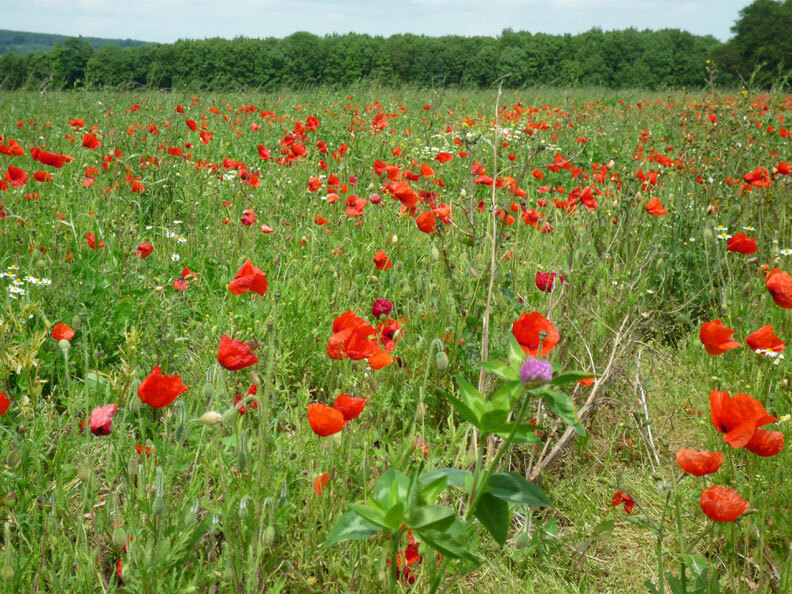 Poppies are good self-seeders and often spring up in disturbed ground, the seed having lay dormant for many years. The plant’s Anglo-Saxon name is popig. Its Latin name is papaver rhoeas. Rhoeas may come from the Greek, rho, possibly meaning red. Plinus, in ancient Greece, claimed that papaver derived from papa = pap, the mashed up food of babies, poppy juice being added to it to help the infants to sleep. (don’t try this at home!) It may also relate to the Latin papula, “papule”, due to the rounded seed capsules. Poppy seeds have been found that date as far back as 25,000 years. An average Poppy produces about 17,000 seeds. The Poppy is also a symbol of remembrance because its red flowers represent the blood of the dead. To the ancient Greeks it symbolised regeneration – Venus is sometimes represented with an apple in one hand and a Poppy flower in the other. It has been used in potion as an antidote to those bewitched to love someone. Poppies were made into dolls by country children – fold down the petals to make a skirt and hold it in place with a belt of grass. Poppies grow to a height of about 2 feet and love being in the sun. Leave the seedheads on after flowering so that the seeds scatter around your garden for next year. 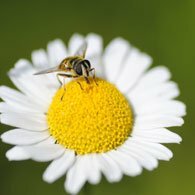 Corn Chamomile is an annual wildflower with daisy-like flowers from May to August. It grows to a height of 12 – 18 ins (30 – 45 cm). 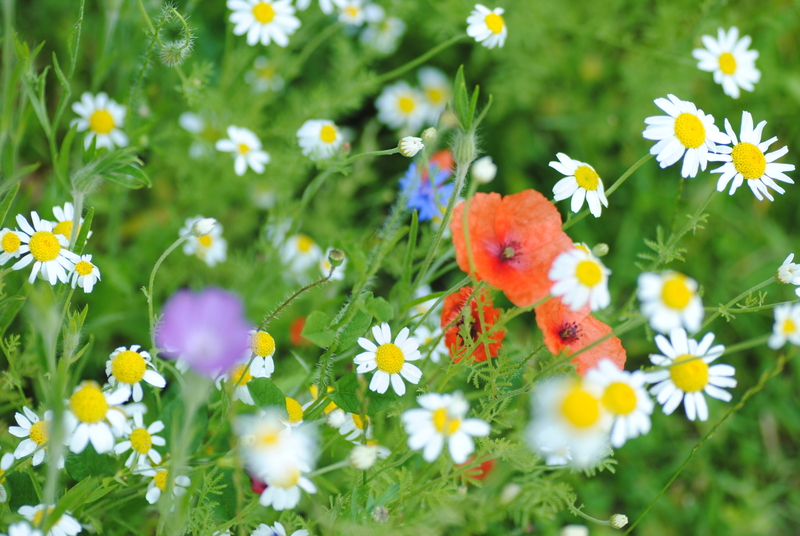 It is a wildflower found in meadows, wasteland and arable land.